Sometimes newfangled gadgetry can scare the unsuspecting public. Other times, they can be downright clueless. 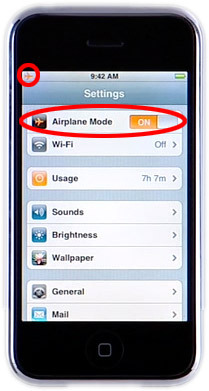 Take for instance the headache that one iPhone user had to endure for using the aptly named “Airplane Mode” on an ATA flight to Hawaii. And yes, this special mode on the iPhone enables users to keep enjoying certain features without emitting radio frequencies. But don’t try telling that to the flight attendant who tried to have Casey arrested. After spotting him watching a movie (“I Know What You Did Last Summer,” for those curious) they informed him that using a cell phone was against the rules. He would have to turn it off, or face the Wrath of the Stewardess. Upon landing, the police are waiting for Casey and he gets detained while they try and figure things out. Thankfully he was let go not long after. It should be noted that Casey took a Southwest flight after that, and theyapparently are aware of Airplane Mode and have it written in the flight magazine (it’s okay above 10,000 feet too).